The views are amazing and the pools, well, are hot! Harrison Hot Springs BC is located at the south end of Harrison Lake, about two hours drive from Vancouver. The beaches are great for sunbathing. The lagoon provides a protected warm-water spot for swimming, which is a good idea because the lake water is cold due to its mountain sources. The Sasquatch (AKA Bigfoot and Group Unconscious Delusion) occupies a unique niche in the traditions of the native peoples of Harrison Lake and River. Since 1840, Europeans have reported everything from sightings to being abducted by Sasquatch. Book a Harrison Hot Spring accommodation and find out for yourself! At this Resort in Harrison Hot Springs there are 20 fully-renovated apartments in five styles. Every suite features stainless steel appliances, pebble fireplaces, high-quality hardwood floors, large windows, and spa-like bathrooms. Visitors can also take advantage of complimentary Wi-Fi and cable with pay-per-view. With 13 rooms available, you're sure to find one to fit your taste and budget at this hotel in Harrison Hot Springs. Rooms have been updated recently with new mattresses, furniture, bedding and amenities. Reception hours are from 11am-8pm daily. This Adult-Only, Guest Lodge in Harrison Hot Springs is situated overlooking the lake, next to a boat launch and It features 3 luxurious, modern Guest Suites and Meeting Rooms. Ideal for a Retreat, a Romantic Get-away, an Adventure Holiday, Simply Exploring the area. 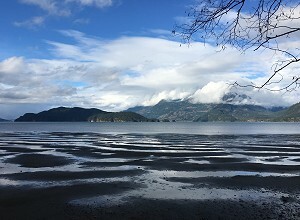 This Harrison Lake waterfront motel, recently renovated rooms, kitchen units, free internet access, cable TV, complimentary coffee, fridges & microwaves, all amenities & restaurants nearby. Our Harrison Mills B&B has a private beachfront for all guests. Free WiFi access is available. A flat-scree TV, DVD player, and pay-per-view channels feature in each room at this bed & breakfast. A refrigerator, coffee maker, and leather sofa seating area are available. A shared bathroom offers a hairdryer and free toiletries. A view of the mountains and the river can be enjoyed from any room. All four of our Harrison Mills suites are fully renovated and individually decorated. Each private suite is self contained with its own separate entrance & parking, kitchenette, living room, bedroom, full tub & shower ensuite bathroom, free WiFi and Satellite TV. Pet friendly. Standing on the Lougheed Highway in Harrison Mills, this lodge-style inn features an on-site pub and restaurant. Free Wi-Fi and a liquor store are also available. The Sasquatch Inn Pub offers a broad menu including a 1/3-pound Sasquatch Burger and a selection of vegetarian choices. The rustic rooms of the Sasquatch Inn provide wood furnishings and a shared bathroom. Our Agassiz Bed & Breakfast is a historical property. There is a seasonal outdoor swimming pool for our guests to enjoy. Free Wi-Fi is provided. Every morning we serve a delicious breakfast. An en suite bathroom is featured in each furnished room. Select rooms include a sofa. There is a lounge, which offers a fireplace and library. Guests can also find a billiard table. Our Agassiz Bed & Breakfast is nestled in a picturesque mountain setting. The country style home has been designed with attention given to servicing the needs of discriminating guests. Each of our guest suites offer satellite wall mounted TVs, private balconies, hardwood floors and large private baths with soaker tub/shower and granite topped vanities. Hot gourmet breakfast is included. Our Fraser Valley B&B is well known for its excellent paragliding environment, spectacular bald eagle viewing and world-famous salmon and sturgeon fishing area. There are a lot of hiking trails and vista viewpoints nearby. Top-tier recreational facilities including ski resort and golf courses, marinas, shopping and dining, all within a short 20-minute drive away. Bear Mountain Ranch and Resort B&B Agassiz 3310 Chaplin Rd.